We’re investors with lots of experience in the Charleston real estate market. We often buy properties fast for cash, but we have other creative solutions too. Do you owe more on your house than it’s worth? Are your monthly payments more than you can afford? Has your property been on the market without any buyers? Did you inherit property and want to make a smart decision? Don’t worry! We can help you. We’re not real estate brokers, so we don’t take a commission to sell your property. We aren’t attorneys or accountants either. Please make sure you get good legal and tax advice on your situation. We’ll make sure you get all the right documents, fill out the right forms, and that everything is handled with the utmost respect and courtesy. We’ll get it all explained to you and make sure you understand the details. There are a lot of guidelines and laws involved with every real estate transaction, and our goal is always to make sure that we do the best job possible, every time. We have a great reputation in the Charleston area because of our honest communication and fairness to everyone. We work hard improving communities and helping neighbors out, one home at a time. Just fill out the form below, or call us now at 843-883-3934 to learn about the options we offer. 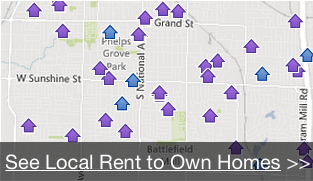 How can I find rent-to-own homes in Charleston?